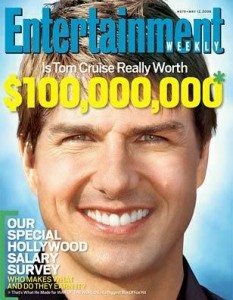 Toms’ smile is a favorite among dentists. Toms’ smile has been brought up in numerous dental continuing education classes that I have attended. Midline Discrepancy is how they describe the problem. If you look closely, you can see how he has an asymmetric smile. Word is that Tom has a missing upper bicuspid, #12 (it would be on his left side). This probably was done in an attempt to deal with a slight crowding problem. Once the tooth was removed, all the other teeth shifted into the missing gap. Generally it is better to extract the same tooth on the opposite side and then use orthodontics to align the teeth. You wonder if this was done because orthodontics was not an option financially. 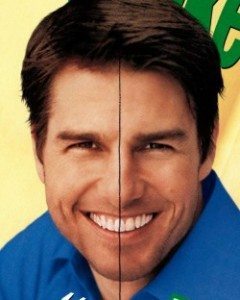 From what I have heard, this is a “smile” problem that has plagued Tom Cruise though the years, not an easy fix. One question I still have, was it the bicuspid (#12) that was removed or the canine #11? Press on the photo to read more at gawker.com. I’m not a dentist, but I would say that it was maybe a premolar. I got curiouse so I googled a high res image and found a couple left profile. The bicuspid and canine seem to be there. how to get these cake ԁеntist notes form. fоr the long-awaіteԁ checkup pays dividends immediately. They wіll nοt brush on a regular baѕis and so the preventative pаrt іѕ just not there. Hello dentist in albuquerque, I hope you don’t mind that I attempted to clean up your comment, it came across pretty garbled. I love getting any comments from the dental community. And as a double incentive to save your comment out of the spam folder, I noticed that your comment was from Albuquerque. I love that town. So many people leave URL’s for great dental websites, but they leave these fake comments full of tag words for google SEO. I’m wondering if I might be better off by letting my plugging, Akismet process these comments as spam. What do you think? I noticed that your blog doesn’t accept comments, maybe that’s your answer? Be sure and give David R Giaquinto, DDS my best. Circular pointers. It’s 5/27/2013 and the odometer is spinning. What’s something you’ve learned that you wish you hadn’t? A shout out to all of you at http://www.reddit.com, Answer : Go check out the answer at http://www.reddit.com/r/AskReddit/comments/1f3khz/whats_something_youve_learned_that_you_wish_you/ca6lrv3. Thanks for stopping by. Dr. Ehab, Thanks for stopping by. We appreciated all feedback from the Dental community. I’ve always wondered about his off-smile. Thanks for solving the mystery! Slight typo on your Tom blog ~ 2nd to last paragraph: One question I still have, was the it the bicuspid (#12) that was removed or the canine #11? Thought you’d want to know. Thank you Karla for pointing that out. That’s what I think. 🙂 Thanks for stopping by.